This post was originally published in 2013. The tips and techniques explained may be outdated. Recently, my colleagues at the SMA Service Line have been receiving more and more questions regarding the registration of Sunny Home Manager plants and the log-in of plants with the SMA Webconnect module. Some customers were unsure as to where exactly they were to find the Product Identification Code, (abbreviation: PIC) and Registration Identifier (abbreviation: RID) necessary for this or where to find the Serial Number and registration ID for the Sunny Home Manager. For this reason we have produced a short video. In this video we also show how the devices are quickly and easily registered in Sunny Portal. When is a PIC and RID (Webconnect module) or serial number and registration ID (Sunny Home Manager) necessary? The PIC and RID are to be found on a label that is included in the data module scope of delivery. These two keys must be entered into the Sunny Portal login screen. The label can either be affixed directly to the Webconnect module or to the inverter enclosure. The label with the PIC and RID keys is to be found to the right next to the type label on the inverter. 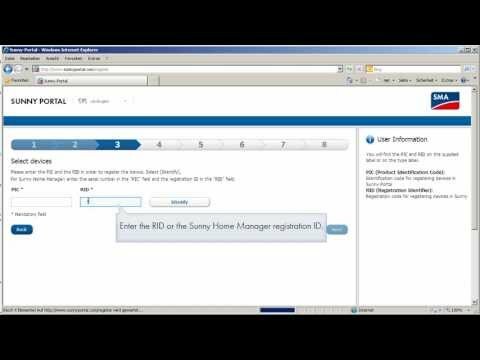 Registration in Sunny Portal is made as described in the video. The serial number must be entered in the PIC field (step 3) during registration in Sunny Portal. This registration ID must be entered in the “RID” field. The PIC consists only of numbers (e.g. 0016800000000000), the RID is always six characters long and consists of both numbers and letters (e.g. XD5JXX). Hello, I am trying to register my Sunny Boy inverter but the only numbers I can find on my inverter is on the label on the right hand side of the unit and they are Model number & Serial number nothing saying PIC or RID. Other inverter types require an additional Webconnect Module, which will come with its own PIC and RID codes printed on the type label of the module itself. If you could send us the serial number on the type label of your inverter, we will gladly provide further information on the available data modules for your inverter type (SocialMedia@SMA.de). I hope that I was able to help you with this answer. For further questions, you may also contact my colleagues of the SMA Service Line. I have a sunny webbox without the label for pic and rid. To register a WebBox at the Sunny Portal neither a PIC nor a RID is required. The registration is done by the “Sunny WebBox Assistant”. This one supports you with the configuration of the Sunny WebBox. Once you have registered for the first time, you will receive your login details by mail directly from the portal. For further questions, you may also contact my colleagues of the SMA Service Line. Hi and thanks for your question. To connect the inverters via Bluetooth@ you need an SMA Data Logger or our free software Sunny Explorer. The default password is “0000” for user and “1111” for installer level. Inverters with Bluetooth@ Piggy Back need a Sunny Home Manager to be registered in Sunny Portal. If you need further assistance, please do not hesitate to call our colleagues from the SMA Service Line. They can analyze your existing communication environment and advise you what the best solution will be. I am unable to find my RID number on my Sunny Boy 3000… (my serial number is: 2001490535 if this is at all helpful) Do I need to purchase a webconnect module? If so, which one would be suitable? let’s find out how we can help you. I’ll ask our specialists over here. I have an off-grid system of 3 x SI 6.0H and 1 x STP12000-TL 10. Tripower and Webbox have showed up in the Sunny Portal without needing me to enter their PIC and RID codes, but the Sunny Islands cannot be detected even though I search for their RID and PIC numbers. However, the Sunny Islands are visible when I login to the Sunny Webbox Assistant. Could you help me to figure out the solution? I can provide you the PIC and RID codes over email if needed. I’m afraid there’s a misunderstanding. The best thing to solve your problem is to call our Service Line. Our colleagues would be happy to help. Please call: +49 561 9522-399 and keep your serial numbers of the several devices and the information about the communication interfaces ready. I need help with PIC and RID. I have a TL-21 3000 and a 1600 TL-10 wiith piggy. How can I start-up with sunny portal and see the statistics? I have serial nr etc but no PIC and RID, its not written anywhere on my inverters. For your SB3000TL-21 (Firmware 2.54 or higher required) you need the Speedwire/Webconnect data module (SWDM-10). This module has an own serial number and the PIC/RID is written on the included stickers. With your SB1600TL-10 (Firmware 4.30 required) you need the Speedwire/Webconnect Piggy Back (SWPB-10). The PIC and RID are also included in the package. If you don’t have these stickers at hand anymore, we need the serial number of your data module. Please contact our Service Line for further assistance. I have a Sunny Boy Model 4000TL-21. I understand that in order to register my PV on the portal I need a Webconnect data module. What module do I need and do I purchase that through the the company that initially installed the inverter? Yes you are right. To register the Sunny Boy 4000TL-21 to the Sunny Portal, you need the SMA Speedwire/Webconnect Datamodule. This module provides free access to Sunny Portal without additional data logger – easily via an existing Internet access. You can purchase the item from your installer. If you wish to purchase this item directly from us, please contact our office in Australia. In my Plant I have three Sunny Mini Central (6000A-IT) provided with the 485PB-NR piggyback interface. They are connected directly through the RS485 line to a PC that runs Sunny Data Control. I’m about to configure it to send data to the Sunny Portal, but there are no sticker on the inverters nor anywhere else indicating PIC and RID. I’m stuck. I would really appreciate your help. Sunny Data Control is not a Webconnect device, it sends an Email to Sunny Portal. 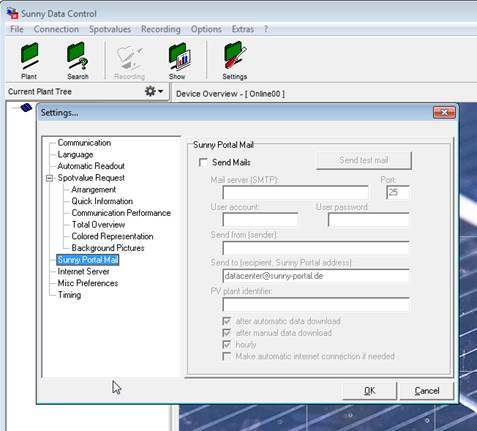 You can configure the data transmission via Sunny Data Control -> Settings -> Sunny Portal Mail. But if you are typing in your SMTP account from your provider – be sure that you can send unencrypted e-mails via port 25. Sunny Data Control is not able to send SSL encrypted e-mails. This program is discontinued since 2010 -> we will not do any development on this software in the future. I have a sma Sunny boy tl3000 but i don’t have the rid. My serial no is 2230283133.
with this serial number we can´t find an inverter. Maybe you have a typing error. But if you have an Sunny Boy 3000TL-21, the Webconnect module is an option. If it is already installed in the inverter, please ask your installer for the stickers of the module. With this stickers you have the Pic and Rid. If you don´t have this additional module, purchase it from your installer, please. Interesting Topic! However SMA should really give detailed information on the communication protocols of Webconnect, none of the manuals say which ports do they use, recently found out that it uses certain UDP ports like 9523 and 3478 which need to be completely open at the router for the webconnect to work, I think SMA should include all these details in the manual along with other possible information. thanks for the feedback. Always good to get some insights from an outside perspective. We took your notes and gave them directly to our Innovation-Team. Have been struggling for a couple of hours to get the connection working between SunnyPortal and my SB 3600. Unlike Pranay Kar configuring port forwarding in the router did not solve the problem. What did solve my problem is putting a fixed IP-address in the SB by means of the Sunny Explorer. I simply used the IP-address that was chosen by the DHCP server of the router. So it seems the DHCP client of the SB 3600 did not pick and use the IP-address handed out by the DHCP server. thank you very much for your advice. It is very useful and other customers will benefit from it! I’m having trouble locating the RID. My serial number is 1913000055.
for a detailed analysis, we need further information concerning your plant. Please contact my colleagues from the Service Line (+49 561 9522-1499) for further assistance. They will help you. RID this is an optional feature according the datasheet. I’m not sure if you have a webconnect interface – if yes – PIC and RID should be displayed on the module or on the sticker close to the module. How can I get the daily emails from Sunny Portal in English? They currently come in German. My colleague has checked and changed it. It should work now. Could you please check again? If it’s not working please contact my colleagues from SMA America. They will be happy to help. If these requests for assistance were answered in more detail, people could find theirs answers by searching rather than bogging down the phone lines. I have an SB 4000US-12 S/N 2007306520 that was just installed by Sunpower as a warranty replacement. It came with the RS485 piggy back module and I have connected it to a laptop running Sunny Data Control software, which is able to correctly display the inverter data. The Sunny Portal Mail is setup and the test mail worked correctly. However, there is no PIC or RID label on the inverter so I can’t configure the plant in Sunny Portal. Can you help me? I just installed a SB 5000TL-US -22 WITH A WEBBOX & 485 data module but cannot find the PIC & RID, where will I find them? I’m not quite sure if PIC and RID are included in the delivery scope of the US devices. Could you please ask my american colleagues? I have a have an Sunny Boy 3000TL-21 with webconnect integrated, and a Fritzbox 3790 router (and a vew vlans and switches in the network at home. I have this installation working fine with sunny explorer over the network. I do not use the 220 modules that came with the installation, because i dont like to have 200 volts connected to the network with all servers etc. The nice thing is that i can configure webconnect using modbus tcp (only 1 port) and udp (only 1 port). If i not use this, the telnet to the SMA does not work and the fritzbox will not open the port 3478 or 9523. If i use modbus tcp 3478 it is possible to open a telnet session to this sma, but the 9523 will never open, becuase it is ude and no telnet session will ever connect to the sma. I have been playing arround for 3 months now, but it is simpley not possible to have a sunny portel connection inti (step 3) with the right rid and pic codes (these are available on stickers and on teh webconnect module). I am not even sure what the sunny portal want or need to find in my network. It could be the sma and what does it wan to do ??? The SMA is able to connect to the internet, it can push data to the site with its own codes in a secure format (so we don’t have to know what it send to the site. All goes well on the sunny portal site, until i hit indentify in step 3, the only message i get is: we can’t connect right now, etc… (even if i open tcp 3478 and udp 9523, or combinations). I have used port 443 and a ship load of other ports (it always delivers me the same mesasage). Remember telnet on tcp 3478 from th einternet was possible, right to the sam somewhere in the back dark korner of my network. What is sunny portal doing and what does it need ? Thanks for your detailed message and error description. First, please make sure that the latest firmware is installed on your inverter. You find the latest firmware in our download area. In order to help you, it is necessary to clarify the next steps for troubleshooting in a personal conversation. Please contact our Service Line directly. My colleagues are happy to help you. I’m trying to set up my 3600tl21 on your site, but everytime I put the PIC and RID code and click on “Identify” I get an error that the PIC and RID code aren’t recognized. On my laptop, the program “sunny explorer is installed” and this tool works fine. What could be the issue that I cannot register my SunnyBoy? Have you already checked this article? http://en.sma-sunny.com/2014/10/24/service-tip-sma-puk-how-to-regain-access-to-your-system-data/ Perhaps this could be the solution? Unfortunately your inverter seems to have no internet connection. This is necessary for the registration. Please be sure to have the newest firmware installed in your inverter and your router/firewall is not blocking SIP communication. If these tips are not helpful, please contact our Service Line (in your country) with your PIC and RID. The service colleagues are able to check the online connection of your device. you don’t need a PIC or RID for the Cluster Controller. Please have a look at the user manual. The RIC and PIC in the label of the SMA inverter SB5000TLST21 not match when i registering in sunny portal. how can i get the real PIC and RID. Sorry that I didn’t get back to you earlier. In order to help you, we need more details, for example your serial numner and die PIC and RID. I suggest that you contact my colleagues from the Service Line directly. They are happy to help you with a personal support. I was unable to find my RID number on my Sunny Island S16.0H-11 (my serial number is: 1261013450). Our system is an off-grid application at a remote site. We already have a webconnect module. Can you please give us our RID code so that we can register to the Sunny Portal to monitor our performance and gather data? there is no PIC and RID for the Sunny Island S16.0H-11, because the device has no WebConnect function. The module your’re talking about is the Speedwire data module for Sunny Island. So it’s only possible to have a connection to Sunny Explorer but not to Sunny Portal. For a connection to Sunny Portal, you need a Sunny WebBox with RS485 . We already installed with RS485 and we logged with pc on the site. After that we tried to register for Sunny Portal and get error (11) which is indicate e-mail address or plant identifier fail. But we try first time to do that and user manual says plant identifer preset automatically. What can we do as a next step? it is possible that either the plant identifier or the email address is missing or both. Could you please check this (Sunny WebBox -> Settiungs -> Data trans)? One possibility is to change the last 5 numbers of the plant identifier and try it again. If it doesn’t work, please contact our Service Line directly. My colleagues are happy to help you. I am sending the present message for a 1,8MWp PV station using MLX60 Inverters operating via an Inverter Manager. According to relative information to the sma.de it is possible to monitor the MLX60 inverters via sunny portal. I have the PIC (s/n) of the inverter manager 139F0215043501N095 but I can not see anywhere the RID code. Would you be kind enough to send me the respective code, or inform me about any other prodecure available to introduce the PV station to the Sunny Portal. in order to have the connection to Sunny Portal you don’t need a RID. The only thing you have to do is to connect yourself with the Inverter Manager (with the LCS Tool). You find the LCS Tool in our download area, here is the link. Here, you see a tab that is called “Portal Upload”. There you can make all the settings you need. Important: It’s necessary that your system is up to version LCS 1.45. We have installed a Sunny Tripower STP 20000TLEE-10, Serial Number 314605812. I would like to use it with the sunny portal and I could not find the PIC and RID number to finish the monitoring! Can you help me? For the connection to Sunny Portal, you need a Webconnect data module. Please have a look at this data sheet. PIC and RID are included with delivery. Please ask your installer or write an email to Service@SMA.de if you would like to order it. Hi, I have installed SMA sunny Tripower STP5000TL. I have PIC and RID codes for the inverter. I am trying to register the inverter to Sunny Portal for the first time via the app installed in my Samsung Note 4. I have paired my Note4 and SMA Bluetooth. My wifi modem cannot be accessed from the location where the SMA inverter is installed. How can I register the plant in sunny portal without internet connection to the inverter? Is it possible to register the plant with Bluetooth? I tried to use sunny explorer, but it won’t install on my MacBook Air? Please help. I would like to register my new installation to sunny portal and monitor on my android phone. The PIC (Product Identification Code) and RID (Registration Identifier) are the required keys for the registration of inverters with Webconnect technology at Sunny Portal (see type label or label at inverter, Webconnect Data Module or Webconnect Piggy-Back included in the scope of delivery). The registration of your inverter can be performed directly at Sunny Portal by using the Plant Setup Assistant that is located directly at the start page of Sunny Portal. To be able to register your inverter, it has to be connected to the internet. Once you have registered the plant successfully, you will be able to use the Sunny Portal App by logging in with your account information. Please note that it is not possible to monitor your inverter with a tablet or smartphone by pairing the devices with Bluetooth. As you already have noticed, Sunny Explorer only works with Microsoft Windows operating systems. Exactly which communication (TCP/UDP) PORTNUMBERS are being used for the communication between the inverter (SMA sunnyboy in my case) and the sunnyportal webite? I’m asking with regard to my FIREWALL configuration. It appears traffic is being blocked and as a result webconnect is not working. Usually, no port configuration is really necessary. You just have to make sure that all UDP ports above 1024 are not being blocked. If it still doesn’t work, please create additionally a port forwarding for the ports 9573 & 3478, both UDP. Please do not hesitate to contact our Service Line directly, if you have further questions. Buenas tardes tengo instalado un inversor sunny boy 700U y una tarjeta 485USPB-nr, y requiero comunicar el inversor con el PC, cual es el procedimiento que debo realizar? agradezco una pronta respuesta. se puede realizar una comunicación con un converter RS485/USB. Ese converter es conectado al inversor al igual que al ordenador despues de habersen installados los drivers correctamente. Con el programa Sunny Data Control 3.93 puedes luego conectarte con tu inversor para observar los datos de tu sistema solar. El programa lo puedes descargar directamente de nuestra pagina http://www.SMA.de en el area de descargas. Le recomendamos que tambien lea las instrucciones del programa y del inversor si tiene algunas preguntas mas acerca de la comunicación. Otra alternativa podría ser un data logger como una Sunny Webbox clássica con RS485. Mas informaciones puedes encontrar también en nuestro sitio de web. Por favor, no dude también de contactar a su Service Line correspondiente a su país si tiene otra pregunta. I am trying to register a PV installations for the sunnyportal using the PIC/RID codes but the identification doesn’t succeed. It seems that it’s not able to connect with the installation. The installation consists of a 100 kW PV system with 4 SMA Tripower inverters STP 20000TL-30 and a SMA Tripower inverter STP 12000TL-10 connected to a sunnywebbox with a RS485 cable network. The webbox is connected with our internal data network. Would this be a firewall problem or does the sunnyportal not support such a configuration? You can register directly via your Sunny WebBox web interface. You do not need a PIC and RID. This key is only required for systems that include the Sunny Home Manager or Webconnect technology. For further information on registering with your Sunny WebBox, please refer to the user manual. If registration via the Sunny WebBox is not successful, please make sure that the network settings are correct and try again. Please enter the password for the “Installer” user group that is set for the device and select [Repeat]. If you do not know the password, select [Cancel]. What exactly is it looking for? is this a password that was set by my installer? Please contact your installer, he should be able to solve your problem. i have an sma sunny boy 8000us-11 installed with a webconnector piggy-back, my issue with the installion is that when i connected the piggy back to the internet modem( i have an wireless adapter one on the cable direct to the inverter and the second one to the modem) my Wifi doesn´t work and when i take off the piggy back i have my internet back, why th piggy-back is interference with my internet conexion? in order to help you, we need further details. Please contact our Service Line directly. They will help you. Good day, I have 2 unit of the SMA Sunny Boy Inverter 5000TL-21. I have tried to register them on Sunny Portal but failed. Both of the inverter have shown the icon of speedwire and sunny portal, however, sunny portal cannot connect to the device. The internet connection to the devices are secure as I have a sunny webbox which connect to the same router and it can access to the sunny portal. May i know how I could solve the problem? Thank you very much. I have found that the inverters displayed an error (Webconnect error: No reply to SIP option packs (10349)). I have created a bridge connection from my laptop and share the internet to the inverters. May I know how to solve it? Please make sure that the newest firmware version is installed on each inverter before registering at Sunny Portal. You can download them on our website in the download area. Please read the instruction manual before performing the update. If the issue persists, please contact directly my colleagues from the Service Line. They will be glad to assist further. Thank you very much for your kind assistance and advice. i have to open ports ? or make a static ip adres ? any one have more success or experience ? which type of inverter do you have? I have two STP15000TL inverters with speedwire/webconnect module. I am trying to register the plant to Sunny portal,but one of the inverter was not detected with the following error. At present, no connection to the device is possible. Please make sure that the newest firmware version in installed on each inverter before registering at Sunny Portal. The version can be downloaded at http://www.SMA.de in the download are. Please read carefully the instruction manual before performing the update. If the issue persists, we would like to recommend you to contact directly our colleagues at the Service Line. They will be glad to assist further. Usually, a common network cable is used (e.g. Cat 5 or Cat 5e) as well as one mating plug for RJ45 pin connector in accordance with IEC 61076-3-106, model 4 with push-pull lock. We would like to recommend the plug sets “STX V4 RJ45” from manufacturer “Telegärtner” or “IE-PS-V04P-RJ45-FH” from “Weidmüller”. I am using two STP15000TL-10 inverters with speedwire/webconnect. I connect the two speedwire/webconnect module using a crossover cable (Cat5) then going to the router using a crossover cable also (daisy chain connection? Is this correct? Or should I use a straight cable after the last inverter going to the router? how about the connection between the two speedwire/webconnect modules? (I would rather recommend an usual/straight network cable instead of a crossover one) or you could daisy chain them also by using conventional (straight) cabling. Please also do not hesitate to check our website for further information regarding the connection of modules. Just a quick handy tip. This way you do not have to climb up the attic when you need any info of the setup ( serial no, PIC, RID numbers, MAC addresses, router default access/wifi setup info, etc etc) when making some changes. I do this for every new appliance now and keep an album on my PC just for this type of info. Hai this is Vinodhini from iPLON india pvt ltd. We have SMA 60kW inverter manager . 3. We have alarms from SMA inverter but we don’t know meaning of the Inverter alarms.. If you have manual for alarms messages please provide us..
please contact our service line from SMA India. Kindly guide me that how can we do remote monitoring of sunny tirpower 60. Without Inverter Manager it is not possible to commission a STP60 plant. Webconnect or Home Manager is not possible with this plant. The Inverter Manager is able to send data to Sunny Portal. Also a FTP push or a SCADA System with Modbus communication is possible. In case of more detailed questions, please contact our service line. Kindly share with us the literature or video that can guide us how we can upload data over sunny portal through inverter manager with or without Modbus communication. Kindly guide me that how can we do remote monitoring of sunny tripower 60. I already commissioned inverters. But don’t know how to register in sunny portal. please watch our video and learn how to register an inverter in our Sunny Portal. In the first few minutes your see how to register a Sunny Boy but it is the same with a Sunny Tripower. You can ignore the last part about activating SMA Smart Connected. This is the only error I’m getting from my system logs. How do I correct it? The nominal PV system power may not deviate by more than -50% / +500% from the calculated total power of all devices (0 kWp) in this PV system. have tried every combination of values we can think of still getting error 🙁 can you help us? we are using STP-60 string inverters with INVERTER MANAGER IM-10. Please guide us for registration of inverter manager with sunny portal. I have a loxone home domotica. With “Virtual HTTP input” is it possible to read values from other devices. Is there a HTTP command to read the actual power from the SMA. With “actual_power” the value name. No, we don´t offer that. A local communication with the inverters is possible in most cases via Modbus. Search for update not compl. successfully: General fault is the last message I got and from now on there is no new data on sunny portal. There also were some messages before :Identification of WAN IP via Sunny Portal failed a few days before but alltuogh it all went as normal. It is advisable to clarify all the details in a personal dialogue. Please therefore contact our Service Line. Our colleagues will be glad to assust further. Here you can find an overview of all contacts. I keep receiving this error “Webconnect error: Registration rejected by SIP registrar” however everything seems to be working correctly and I can remotely monitor. ? The behavior of your device is abnormal. Even if everything works correctly, one should find out why this error is displayed. Therefore please contact our service line. Our colleagues will assist you in a personal dialog. Here you can selcet your country and find the phone number of the service line in charge for you. I got the information that this error is already known to our Service Department. The wifi-connection at the place of the inverter could be one reason for it. If you’ve got a network cable, you can try and connect it with your inverter. The connection may be better then. I have 3 SB2.5-1VL-40 inverters installed since about 6 weeks. Yesterday (1 Aug) between 10:30 and 10:40 they all generated a pair of “10350 Webconnect error: Registration rejected by SIP registrar” errors. There were no other errors generated. The inverters are registered in Sunny Portal, and data seems to be flowing. The errors are visible on both the SunnyPortal and local interfaces. The 3 inverters have both a wired and wireless connection to the modem/router. Is there something to be done on my side to correct / avoid this ? Please use in this case our online service center or contact our service line in charge. The numbers you can find here: https://www.sma-service.com/en/contact/contact-form.html. The Connection Status to Sunny Portal in Sunny Home Manager Assistant is “ok” and still I can’t register my sunny home manager using PIC and RID. Any idea why that doesn’t work? We are not able to do a remote diagnosis without knowing anything about your system. Please contact your installer, he knows your system and the local conditions the best. Bit late to this discussion, im about to buy the webcoonect module for my SB3000TL-20 (sn 2100566303) when i read all the documentation it only gives reference to the SB3000TL-21 does this mean my inverter will not take the webconnect module ?? the inverter does have firmware 3.20 and does have the module plug behind the lcd panel but before i buy i would like to confirm my inverter SB3000TL-20 (sn 2100566303) is compatible can anyone help ? all the documents ive read relate to the SB3000TL-21 ? My inverter does have the plug behind the lcd for the webconnect module please help before i purchase a webmodule. There is a plug for the ribbon cable behind the LCD screen on the inverter, can anyone confirm if the inverter is compatable or not ?